If there's one company I could pick as putting their neck on the line in the name of new technology, it would be OCZ. Responsible for bringing unique and often groundbreaking products to the enthusiasts market such as the NIA (Neural Impulse Actuator), DIY Notebook and more recently a whole range of affordable Solid State Drives, OCZ are one of few companies that seem to constantly act in the interest of the enthusiast and the name of progression. Today we're going to be taking a look at yet another product that breaks the conventional mold, and although maybe not as groundbreaking as some of the aforementioned devices, certainly caused mixed reactions when it was released at the end of last year. 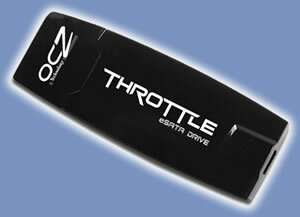 The OCZ Throttle 32GB may look like little more than a rather standard (yet a little bit chubby) USB memory stick, but under the plastic dust cap it packs a secret punch....it's not USB. Yes that's right, OCZ have done away with the family favorite standard connector that has been supported by every PC and Laptop made in the past 10 years in favor of the fairly recent eSATA standard. With read speeds quoted to be around 90MB/s, the Throttle may not be anywhere near saturating the full 300MB/s bandwidth available on the eSATA interface, but at 30MB/s higher than the maximum 60MB/s throughput of the USB2.0 interface it's instantly apparent why the Throttle couldn't be just another USB stick. However, there are certain caveats to using eSATA rather than USB, so let's move on to the next page where we take a look at the Throttle in more detail.